The taste of authenticity is slowly being sullied with over-produced and super-saturated flavors. The technological era has opened a portal through the computers and laptops of the average citizen to create sounds that could once only be produced in studios. While creating more opportunities for people to produce amazing music, it has become harder to sift through the good and the bad. However, when truly authentic music is created, it does not go unnoticed. Hailing from Charlotte, North Carolina, gypsy-soul duo Lovesucker is invigorating the music world with their emotive musicianship and strong female vocals. With Zoltan Von Bury on guitar, bass, drums, and organ, he draws his inspiration from the classic rock of the 1970s. "I write music with an Indie sensibility, embracing early 70's true funk tones and nuances...Nothing more than that. So the descriptions 'Indie Funk and Gypsy Soul' actually have a true meaning or a power source, if you will. That is who we are and what we do. Simple as that. There are no examples for those terms because there is no one out there doing this sound, this is our sound," he stated. Songbird Crystal Crosby draws her inspiration from the more subversive side of music. Etta James, Grace Slick, and Tori Amos are three of the most prominent muses that drive her. She says, "While many were painting the picket fences, these pioneers were torching the grounds with their guttural truths of the ache of love, revenge and survival." Apparent in her powerful voice and lyrics, her style is referred to as gypsy-soul, which she describes as "a state of mind - freedom, movement, fire and heart, even if it's fragmented... to move through a song and sound with fluidity and transparency, embracing those things that we speak of - love, spark and hope, dazzled with trickery and fury." Together, they create a world full of evocative sounds incomparable to any other style. They choose to be challenging versus comfortable, always pushing boundaries instead of remaining caged by the confines of societal norms. Their lead single "Mississippi" spins a yarn that is both thought provoking and poignant. It tells the tale of a dead slave who returns to eternally haunt and torment the life of his former master. The rich culture of the American South weaves its way into their music, creating modern and timeless tracks. 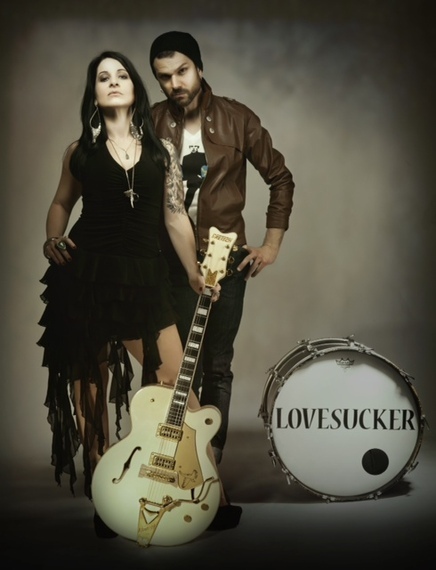 Crystal Crosby and Zoltan Von Bury's musical chemistry translates nicely on their self-titled album Lovesucker. Still very new, Lovesucker has a lot of evolving to do. Just like all the greatest musicians of our time, they are slowly honing in on their gypsy-soul sound, discovering balance between each other's differing musical styles. Fueled by Von Bury's infectious riffs and head-bobbing beats, the instrumentation on Lovesucker is what moves my auditory cortex the most. His skill for arrangement facilitates the story of their sound. His ear for music that goes straight for the solar plexus is impeccable. Sung and played straight from the heart, their music is unique yet accessible, playing to the pathos of the human psyche. Lovesucker is at the beginning of their grand tale, and at the rate they are going, it is a story that will never be forgotten.